Often the bridge that brings people together, authentic food experiences have always been the avid traveler’s manna. Whet your appetite for travel and discover the cultural heart of a destination with Enchanting Travel’s handpicked selection of unique and authentic food opportunities. 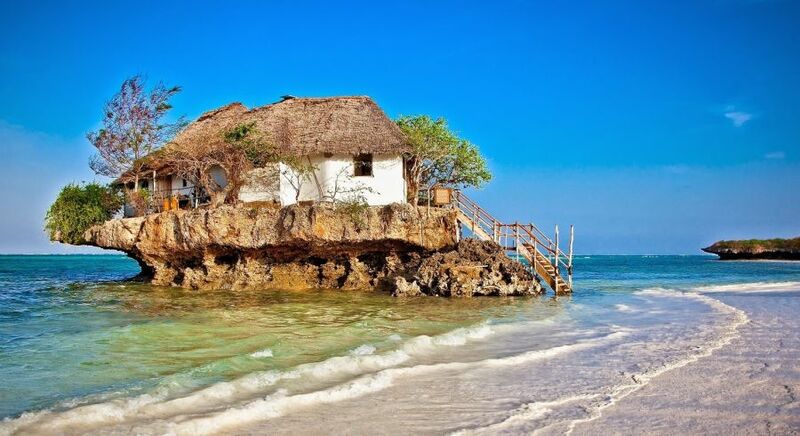 Be the Robinson Crusoe of your own life with a unique dining experience on a rock at a restaurant in Zanzibar – aptly named Rock Restaurant. Rising out of the sea and not far from the beach, you can walk there at low tide. At high tide, a short boat ride is required to reach this authentic and magical experience, followed by the steps up to a wonderful fairy tale thatched cabin. Enjoy the mastery and passion of the fresh, Swahili (coastal) food as you gaze into the ocean from the wonderfully romantic al fresco rock terrace with its sandy floor. Dine in style at one of the most famous restaurant’s in Tanzania! We think this is contemporary simplicity with a wonderful smattering of African chic – a perfect getaway! The cardinal rule of travelling is to try and find the most authentic cuisine available. This comes with a caveat: do not expect fine linen on your table or tall-stemmed and glistening wine glasses. Instead embrace the full experience of real, everyday cooking with real, everyday people. In downtown Nairobi, Kenya, we’ve found just the thing to tickle your taste buds. 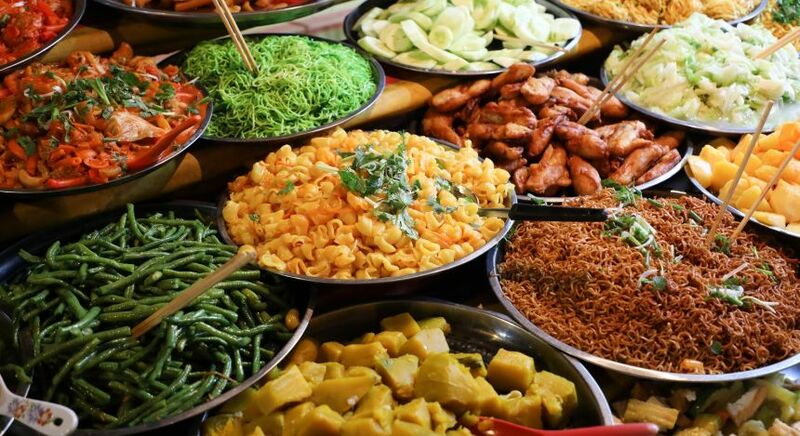 Kosewe (or Ranalo Foods as it is also known) is a fantastic spot on Kimathi Street and near Nation Centre in Nairobi’s city center. With an outdoor terrace complete with umbrellas, this bar-restaurant has become a popular local spot, providing a lively atmosphere with live bands and even some dancing by night. Whilst simple and without airs or grace, the establishment boasts good hygienic standards. The beef fry, black-eyed pea stew (known locally as kunde), coconut stews and chapattis are just some of the Enchanting Travels favorites on the menu. Cooking is at the heart of the Khmer people in Cambodia and is one of the oldest living cuisines in the world. 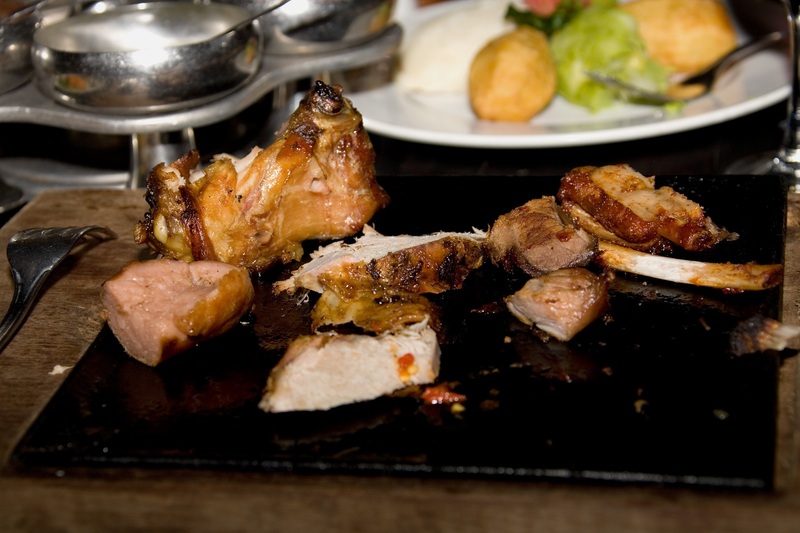 During the 1970s when Cambodia was under the Khmer Rouge regime the cuisine was nearly wiped. However in recent decades there has been an uprising to revive it and you can experience this for yourself during an Enchanting tour of Cambodia. Why is Cambodian cookery so delicious? Because it’s simple, seasonal, fresh and very local – with vegetables, edible flowers and many herbs and leaves bought from the Pasa Ler or big market. Then there’s rice in all its varieties – from jasmine-infused or wild to sticky! Follow the daily pattern of preparing a home-cooked meal. Let your guide navigate you through the labyrinthine streets that make up a Pasa Ker and witness for yourself the ingredients on offer. Head to a local noodle shop to see fresh rice noodles (nom ben chok) being prepared. 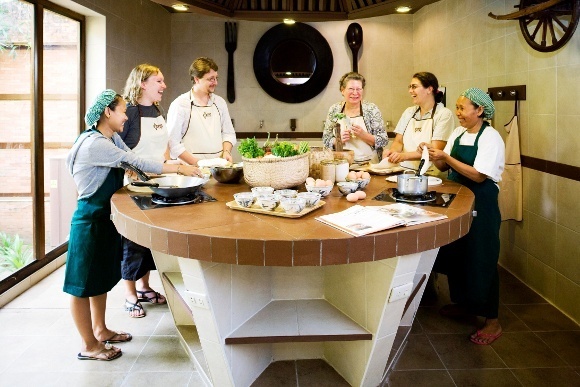 A Khmer chef can help you prepare an authentic feast at either the Khmer Village House during your stay at Amansara, or at Angkor Village Hotel in Siem Reap! The Baci ceremony is a fundamental event for celebrating special occasions in Laos, such as births, marriages and new guests. The Baci ceremony, pronounced Buy-see, is a pre-Buddhist ritual and part of Laos culture for hundreds of years. Its purpose is based on the ancient belief of invoking the spirit or enhancing the soul – known as sou khouan – by synchronizing the 32 organs of the human body. This then returns the spirits that protect each organ when they go wandering and provides balance, prosperity and blessings. 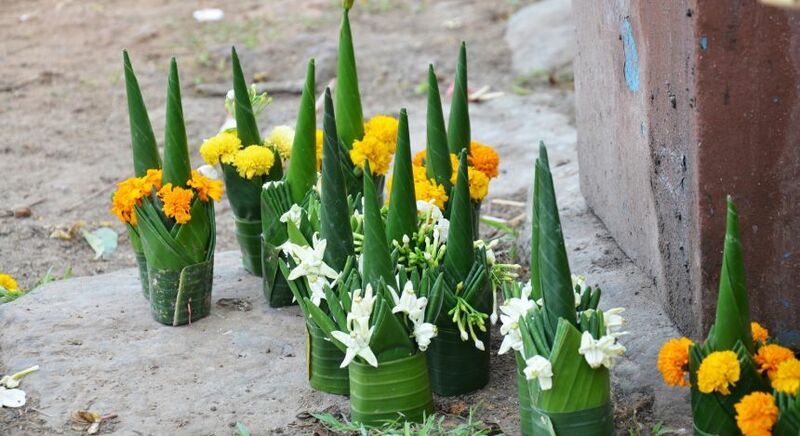 Sacrificial offering made from banana leaf and flower at Wat Phu in UNESCO World Heritage site in Pakse, Champasak, Laos. Ceremonies, conducted by a Mo Phon (master of ceremonies) also take place after a death so that spirits are raised. Part of the ritual includes tying a white string around the wrist. Guests can observe a traditional Baci ceremony before devouring an honorary Laotian meal. 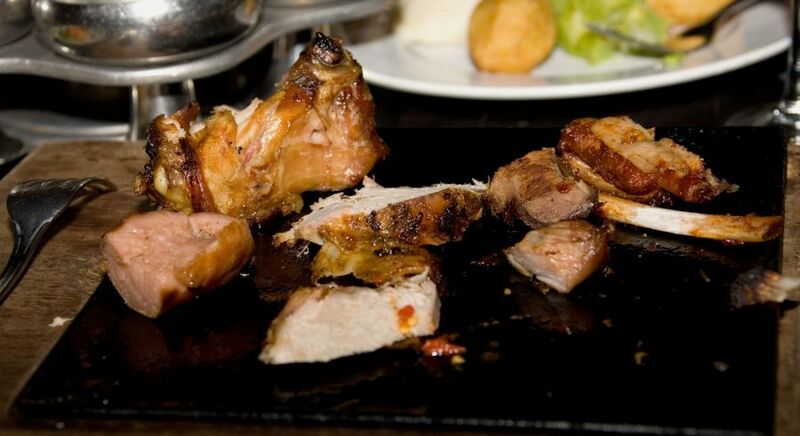 Authentic food-seekers will be in their element with the famous street parrillas (grills) on the streets of Buenos Aires. Choripan is the classic street food in Buenos Aires, Argentina. Choripan is by all means greasy, messy and oh-so-amazingly street-foodie delicious. Choripan is the word-play name of the Argentine sausage sandwich, taken from the words chorizo (Argentine sausage) and pan (bread). It is literally a grilled sausage sliced in half lengthwise, placed inside a slice of crusty French bread. It this then lathered with chimichurri (a typical sauce made of finely diced garlic, parsley, oregano and other herbs in olive oil) and/or salsa criolla (diced fresh tomatoes, parsley and onions). 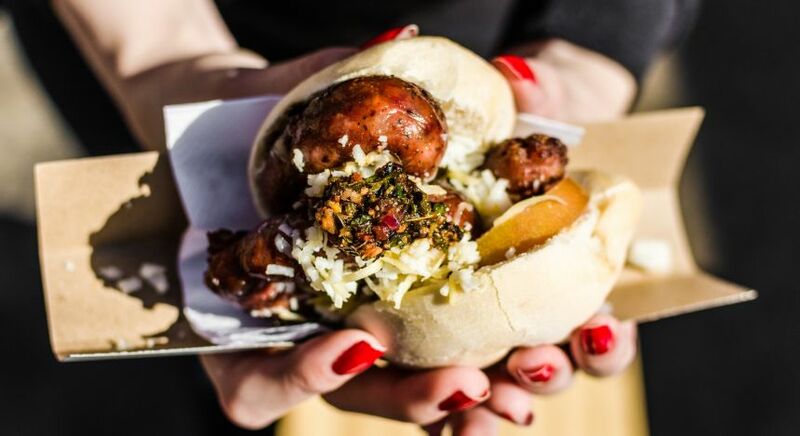 As you wander through Buenos Aires you will discover many choripan and parrillas, particularly on the rambling promenade or river walk of Costanera Sur, around the futbol stadiums and outside the Reserva Ecologica (ecological reserve) in Puerto Madero. Locally, this area is affectionately known as “Chori-central” for its high concentration of stands. It’s a mouthwatering experience as the grill smoke rises and flavors the air, particularly after one too many Malbecs the night before! 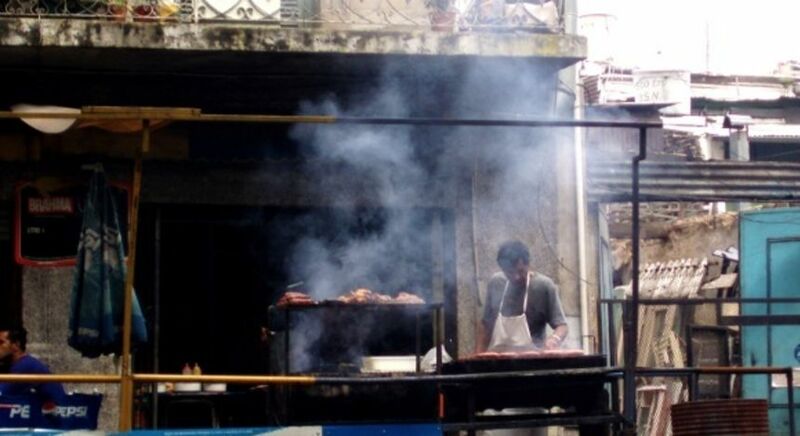 In case you are wondering, street food in Argentina, Brazil, Uruguay and Chile is generally safe and hygienic. We recommend you consult your Trip Coordinator for advice on where to go. 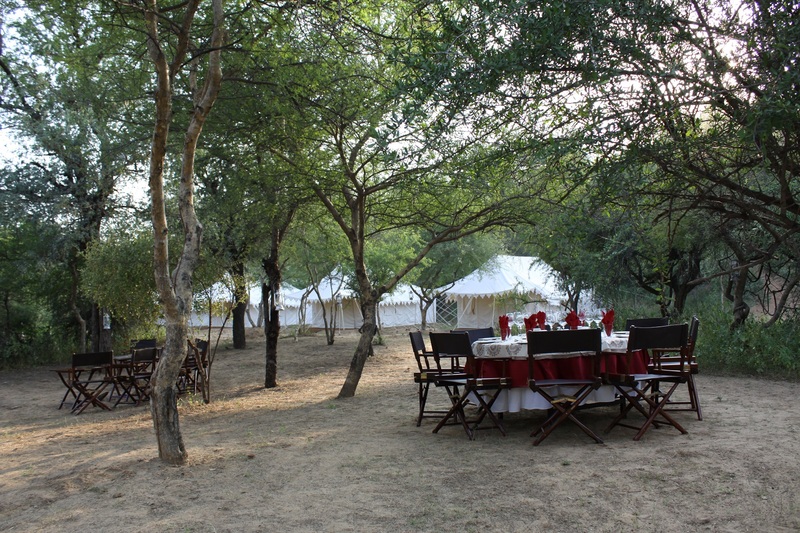 Our guests tell us that one of the absolute highlights of their custom tour in India is time spent in the outskirts of Jaipur in luxurious yet natural surroundings. 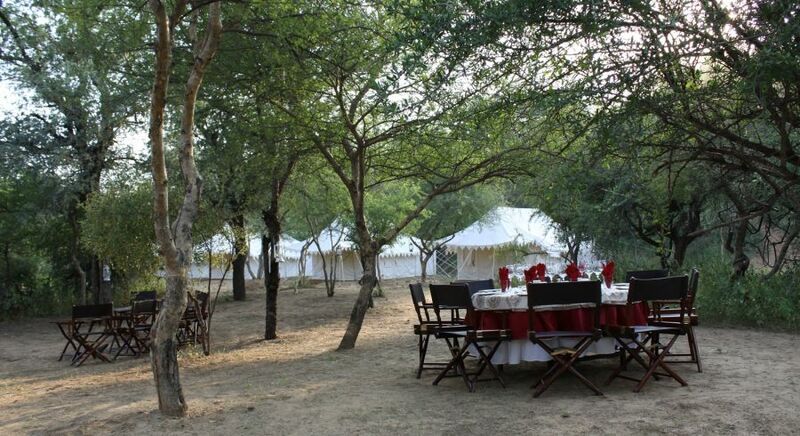 After experiencing an elephant ride in the Aravalli Hills, it’s time to kick back and relax a little. Dera Amer offers a beautiful al fresco venue in the center of a private forest, lit up beautifully with mashals (flame torches). It’s here where you can enjoy a live barbeque and often exclusive folk dances and local musicians. With authentic soul, this is not your typical tourist dinner-entertainment experience in India. To truly spice up your travel to India then you might wish to explore the Chettinad region of south Indian state Tamil Nadu. Why? Because it’s here that you’ll find some of the spiciest and aromatic food in India. 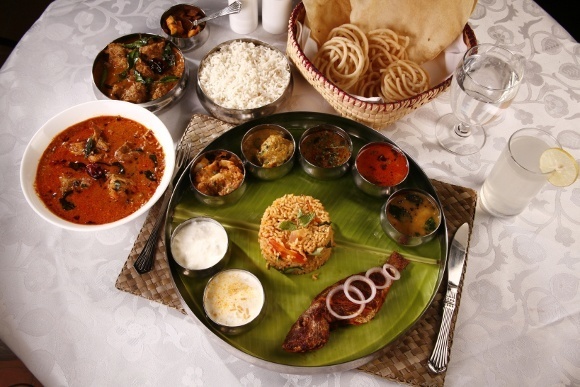 For foodies, Chettinad is a paradise. The spices are varied and versatile, such as star aniseed, tamarind, whole red chilles, fenugreek, fennel seeds, cinnamon, cloves, peppercorns and cumin, not to mention the crispy tang of fresh curry leaves! The pungent and freshly ground masalas of the renowned Chettinad chicken dish, topped off with a boiled egg, is just one example. Seafood is also popular. As most accompaniments are made out of rice and rice flour, such as dosa, idli and appams and idiyappams, you can expect a very fulfilling feast indeed. Chettinad is not just a region but also considered a social caste that specialize as master chefs so it’s certainly the right place to pick up a few tips to perfect your Indian curry. Enjoy exploring the distinctive flavors with an interactive kitchen experience or two at Visalam. 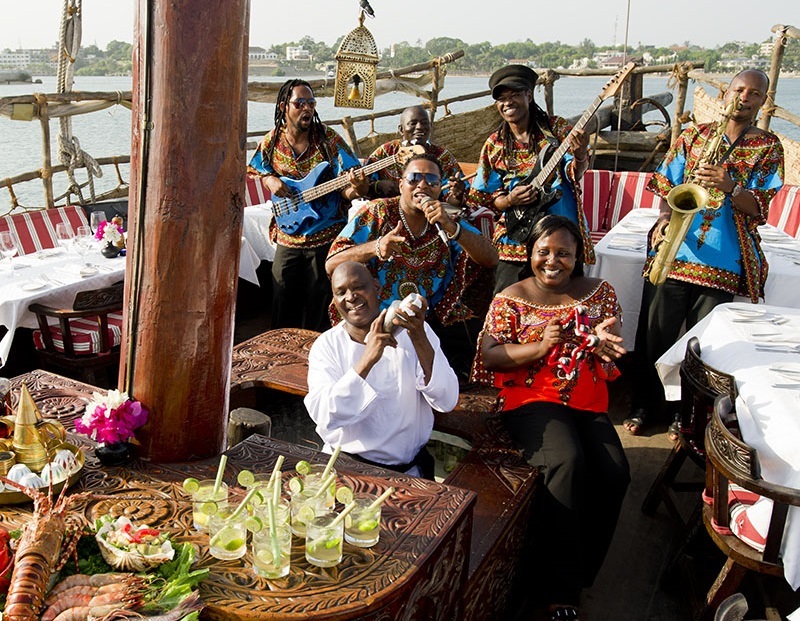 Cruise along the canals of the coastline of Kenya for a very interesting and delicious dining experience on a floating restaurant. In Mombasa the Tamarind Dhow offers two traditional Arab sailing boats, known as jahazis that were previously used to trade cargo from Africa to the Arab states. 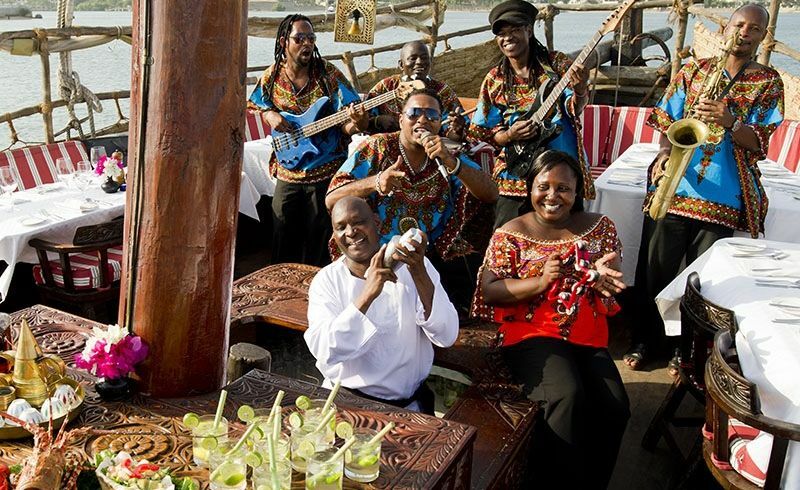 With considerate refurbishment, this floating restaurant offers the finest Swahili seafood platters of prawns and lobster, Kenyan beef fillet and its signature Tamarind Salad. As you gently glide towards Fort Jesus you can enjoy the twinkling lights from the coast and the resident band’s music. To finish off a delicious dinner, enjoy the Kenyan coffee and halwa. Don’t forget to enjoy a welcome Dawa cocktail! We know that authentic culture seekers are fine with getting up early from time to time to make the most of a holiday. You’ve seen the splendid Taj Mahal at sunrise, so what’s next? Bhangarh in India. Midway between Delhi and Jaipur within rural Rajasthan stands this fine and lesser known medieval site. Whilst Bhangarh’s considered one of the finest heritage sites in India, few travelers visit. Built in the 1600s by the Jaipur royal family of the time, the ruins are said to be haunted by local villagers after being cursed by an evil court musician. Certainly, there is something otherworldly about this abandoned city with its aged palaces, bathing pools, temples and bazaars, but there’s also an alluring beauty too. Untouched green lawns and woody trees have become a favorite spot for macaque and langur monkeys. Our guests can get up at sunrise to travel there in time for a leisurely picnic breakfast. Oh and did we just say breakfast? Sorry, we also meant yoga too. Yes, you can get your yoga mat out and meditate in the utter tranquility that is Bhangarh. A combination of authentic food experiences and discovery of North India’s incredible heritage and culture, this tour is not to be missed! Please note that visits to Bhangarh between sunset and sunrise are legally prohibited. Whether you’re in Rio, Paraty or Picinguaba in Brazil, the beach and sun undoubtedly makes these authentic food experiences all the more delicious. Açaí, the purple berry that hails from the Amazon rainforest has received much attention as a superfood due to its antioxidant properties. With its thick milky texture, the berry is blended in Brazil into a perfectly smooth and slushy paste. It’s then accompanied with a sprinkle of granola, sliced bananas and a final drizzle of honey. 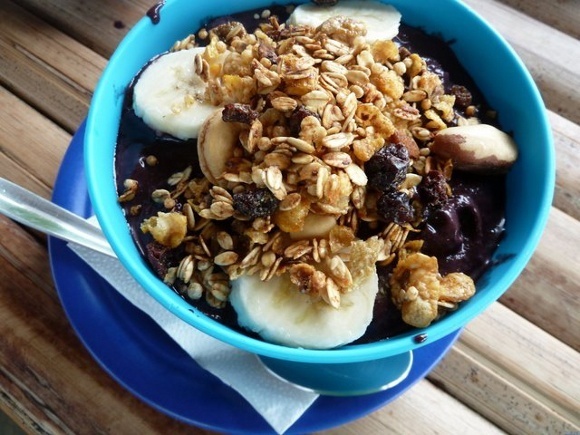 This power bowl will give you enough energy to tackle a day of beach delights and make it through the tropical heat until lunchtime and is one good mouthwatering reason to discover Brazil. Whatever authentic food experiences you are looking for on your travels let us know. With our local presence and destination expertise, we’ll be happy to arrange them as part of your Enchanting Travels adventure.